UberMask | Mac App Storeのアプリ検索・ランキング BuzzMac! UberMask hides files and folders on your Mac. Quick and Easy. 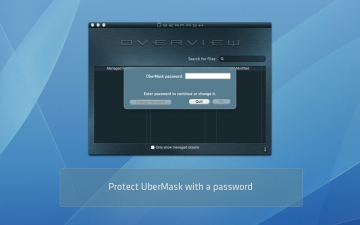 Use UberMask, a MacWorld MacGem 2011 pick, to hide your private data from curious eyes with cyberspeed. And there is no chance that your family members, collegues or friends stumble across your files and folders when using your Mac. Even Spotlight will not find your hidden data! 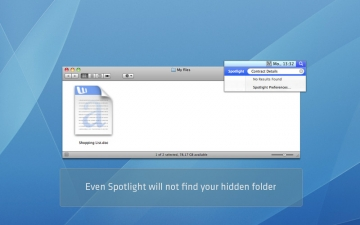 Neither the Finder nor Spotlight will be able to detect the hidden data. You can always run UberMask to see which files are hidden thoughout your disks, to hide more files or to reveal files. Hide all selected data with a simple key stroke! 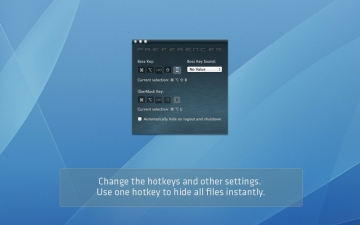 Choose a hotkey combination and activate it anytime to hide your data. The UberMask app does not have run or be launched for the hotkeys to operate. It works like magic and keeps your conscience clean whenever your Mac is used by someone else. UberMask is a Gem of a Mac app thanks to its seamless integration with OS X and its ease of use. It’s worth a look for anyone interested in hiding sensitive data on their Macs. If you’re a secret keeper, UberMask is useful and inconspicuous. It’s not hacker-proof, but it’ll certainly keep your confidential files and folders safe from the prying eyes of coworkers, kids, or your partner. If you have need for something like UberMask for simple file security, then I recommend giving it a try.